Between the summers of 1984 and 1987 as a postgraduate student in the Department of Zoology in Trinity College, I made thousands of measurements in a study of shell shape variation in the Painted Topshell Calliostoma zizyphinum (L.). Initially my research began as a project to investigate differences between the variegated and white types of this mollusc, but it expanded to a study of the shell shapes of 24 populations around the Irish and French coasts - and how the shape is influenced by environment. 29 years later I still have my data! Image source: Shell Collection by José Santos. 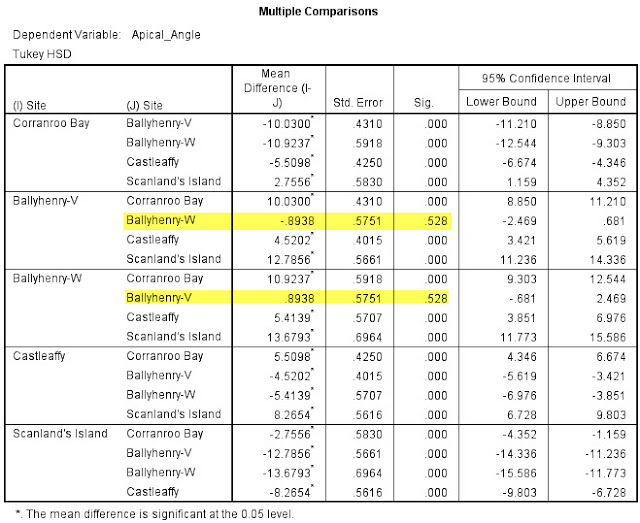 Last week in my Statistics class I used some of my own data from some of my sample sites: Castleaffy Strand in Clew Bay, Corranrroo Bay and Scanlan's Island in Co Clare, and Ballyhenry in Strangford Lough. For the Ballyhenry sample I measured two variations of the shell (white and variegated - see diagram above) - this means I had five samples from four sites. The topic being discussed was Analysis of Variance (ANOVA) - so I used my five samples to determine if there was a significance difference between shells from the five samples based on just one of my measurements - the apical angle (in degrees) at the top of the shell. 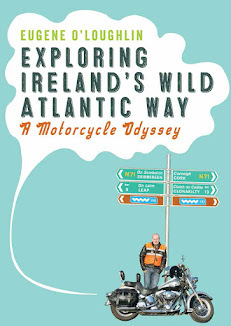 Of course in 1987, when I was writing all my work up, I did not have the benefit of statistics packages like IBM's SPSS or the statistical programming language R. At that time I used the single mainframe computer in the College, which was located in one laboratory in Pearse Street. The results shown were very interesting. The most important column above is the "Sig." column (third from right). Prior to this test I would have set a significance level of 95%, which means I would have just a 5% chance of making an incorrect decision - this is represented as an alpha value of 0.05. If my "Sig" level is less than 0.05, I have found a significant difference. As you can see above, the "Sig" is less than 0.05 in almost all lines which compare each sample with all others in turn - these indicates that each sample is significantly different from each other. 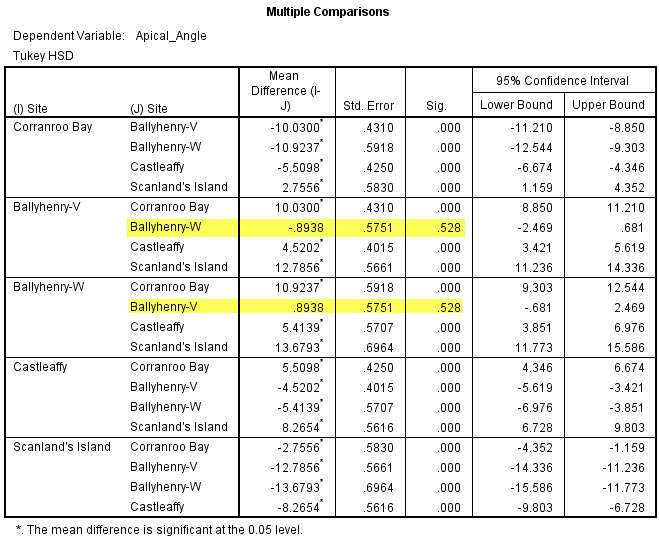 Highlighted in yellow is a comparison of the two Ballyhenry samples (variegated and white) - here the "Sig" is higher than 0.05 which indicates that there is no difference between these two samples. While I have found a difference in shell shape between the samples, only the two Ballyhenry samples are not different. This is not a surprising finding given that the two Ballyhenry samples were taken from the same location. Shell shape is influenced by the environment (such as wave power, sea current, exposure, seaweed cover). Given that the white and variegated topshells live in the same location, I have found that their shell shape does not differ and can make a preliminary finding that the shell colour is not affected by the physical environment. Notes on the distribution of Calliostoma zizyphinum (L.) (Mollusca) on the shores and shallow waters of the Irish coast. Bulletin of the Irish Biogeographical Society No 12. Morphological variation in the painted topshell Calliostoma zizyphinum (L.) (Prosobranchia:Trochidae), from inter-tidal rapids on the Irish coast. Abstract. Journal of Molluscan Studies, volume 53, pp267-272. An analysis of shell shape variation in the painted topshell Calliostoma zizyphinum (L.) (Prosobranchia:Trochidae). Abstract. Journal of Molluscan Studies, volume 53, pp62-68.